Southern defenders Austin Baker (20) and Jensen Anderson (24) apply pressure to River Valley’s Chase Caldwell (14) during the second half of Friday night’s boys basketball contest in Racine, Ohio. River Valley defenders Chase Caldwell (14) and Brandon Call (11) contest a shot attempt by Southern’s Brayden Cunningham during the second half of Friday night’s boys basketball contest in Racine, Ohio. RACINE, Ohio — A similar story in this tale of two halves. 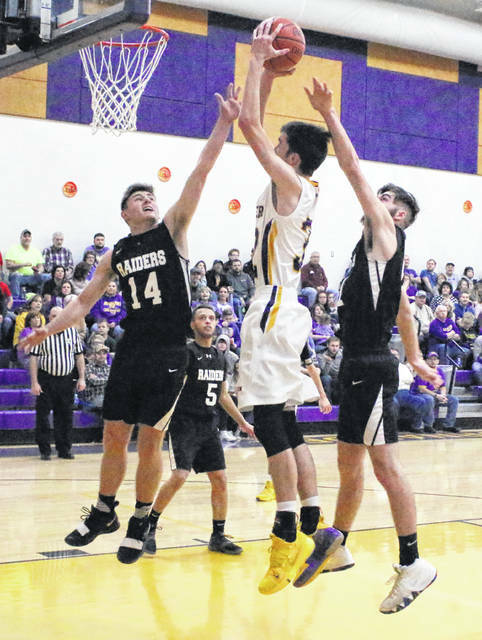 Both teams had their share of ups and downs over the course of 32 minutes, but the Southern boys basketball team built a 20-point halftime lead and ultimately held on for a 48-38 decision in a non-conference matchup on Friday night in Meigs County. 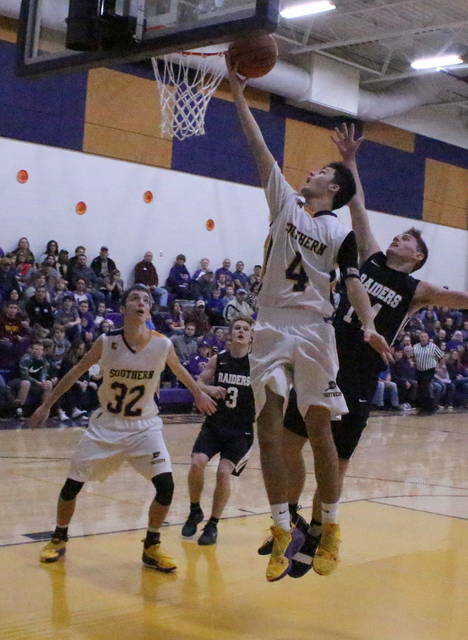 The Tornadoes (9-7) never trailed in the contest as the hosts established an early presence on the offensive glass, which led to their first three baskets while building a 7-2 cushion a little over two minutes into regulation. The Raiders (2-14) trailed by as many as nine points three minutes into the game, but the Silver and Black countered with four consecutive points and closed the gap down to 9-6 following a Jordan Lambert basket at the 3:36 mark. The guests, however, were ultimately never closer the rest of the evening as the Purple and Gold closed the canto with a 4-2 spurt — making it a 13-8 contest eight minutes into play. Southern made a pivotal defensive stand in the second frame, one that ultimately turned the tide of the outcome. The hosts reeled off seven straight points to start the stanza and forced RVHS into 11 consecutive missed shots and a single turnover in the first four minutes, allowing Southern to extend its lead out to 20-8. Lambert ended the drought with a basket at the 3:35 mark to trim the deficit in half, but the Raiders ultimately had three more turnovers and three more missed shot attempts the rest of the half as SHS closed the second period on a 12-2 surge for a commanding 32-12 edge at the intermission. There were three key reasons for Southern’s large lead at the break, most notably its advantage from behind the arc. The hosts were 5-of-11 from 3-point territory in the opening 16 minutes, compared to a 0-for-9 effort by the Raiders in that same span. The Tornadoes also owned a 10-7 edge on the offensive glass and committed only five turnovers before halftime, compared to 11 miscues by RVHS. Not much of those advantages changed in the third stanza as the Purple and Gold made a small 6-4 run at the start of the second half, with Jensen Anderson capping things with a basket at the 3:54 mark — allowing the hosts to secure their largest lead of the night at 38-16. The Silver and Black retaliated with five consecutive points before Brayden Cunningham added a free throw with 2:29 remaining, making it a 39-21 contest. Both teams went scoreless over the rest of the third frame. The Raiders — who made 7-of-11 shot attempts down the stretch — hit a trio of trifectas during a 15-4 surge that closed the gap down to seven points with 2:19 left in regulation, but the guests ultimately came no closer. SHS — which had as many turnovers in the fourth quarter as it did in the first half — also missed 6-of-9 charity tosses in the final canto, yet still closed the final 1:32 on a 5-2 run that wrapped up the 10-point outcome. Neither squad shot better than 35 percent from the field, although Southern did have a slightly better touch from around the perimeter. The hosts also had three more total rebounds, four more offensive boards and nine fewer turnovers by night’s end. Afterwards, SHS coach Jeff Caldwell noted that he was pleased with the effort early on and that his troops managed to hold for the victory. Caldwell, however, also pointed out that basketball is a four-quarter game … and that his team didn’t play with as much purpose in the second half. And that, as he mentioned, made things a little more interesting down the stretch than they needed to be. “I thought our defense was good for most of the night, especially in the first half. We were getting some loose balls and did a good job on the boards, and it showed in how we built our lead,” Caldwell said. “We lost some aggression in the second half. We need to understand that teams are going to come after you a little more when you have a lead, and we didn’t handle that situation great. We definitely need to keep our intensity and out focus for four quarters of basketball. The Raiders made 10-of-21 shot attempts after the break — including all four of their 3-pointers — and also had only three more turnovers than the hosts during that span. River Valley also outrebounded SHS by a 16-11 margin in the second half. RVHS coach Brett Bostic was pleased that his troops never surrendered, and in doing so turned an otherwise lop-sided contest into an actual ball game with under three minutes left. Still, the goal is to put four quarters of basketball together … and that is still the main goal for Bostic as the tournament trail approaches. River Valley outrebounded the Tornadoes by a 34-31 overall margin, but the hosts claimed a 15-11 edge on the offensive glass. The Silver and Black committed 23 total turnovers, nine more than Southern’s final tally of 14 miscues. 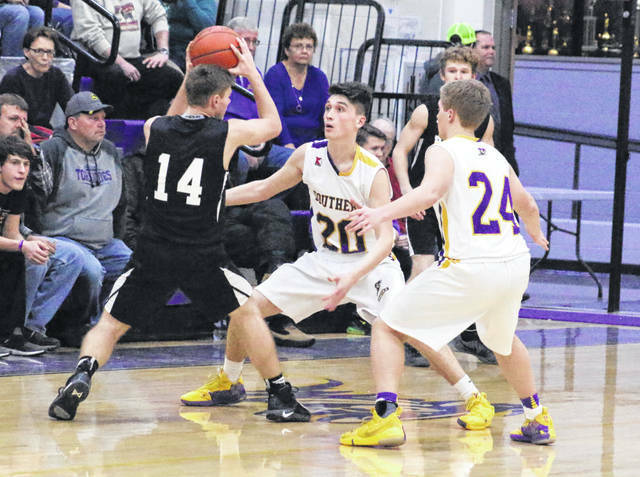 SHS netted 18-of-51 shot attempts for 35 percent, including a 5-of-14 effort from behind the arc for 36 percent. The Purple and Gold were also 7-of-17 at the free throw line for 41 percent. Anderson hit all five trifectas and paced Southern with a game-high 19 points, all of which came through three quarters of play. Weston Thorla and Austin Baker were next with seven points apiece, followed by Brayden Cunningham with five markers. Trey McNickle and Arrow Drummer were next with four points apiece, with Coltin Parker completing the winning tally with two points. Cunningham paced SHS with seven rebounds and McNickle grabbed six caroms, while Baker and Parker each hauled in five boards apiece. The guests made 15-of-49 field goal attempts for 31 percent, including a 4-of-19 effort from behind the arc for 21 percent. RVHS was also 4-of-5 at the charity stripe for 80 percent. Lambert led the Raiders with a double-double effort of 14 points and 10 rebounds, followed by Chase Caldwell with eight points and Rory Twyman with seven markers. Brandon Call and Layne Fitch completed the scoring with six and three points, respectively. Caldwell followed Lambert with nine rebounds, while Call and Fitch respectively chipped in six and four caroms. 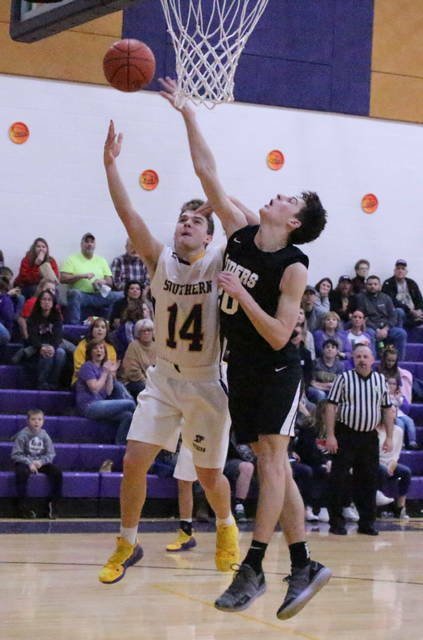 Southern traveled to Point Pleasant on Saturday night and returns to action Tuesday when it travels to Mercerville for a TVC Hocking contest at 6 p.m.
River Valley was at Gallia Academy on Saturday and returns to the hardwood Tuesday when it hosts Oak Hill in a non-conference tilt at 6 p.m.